French poet, historian, and essayist; born at Paris Nov. 21, 1694; died there May 30, 1778. His name was originally François Marie Arouet; but about 1718 he assumed the name of Voltaire. He is known to the world as one of the most active and popular champions of free thought and as an ardent advocate of religious as well as political liberty. It is the more surprising that he who, in his "Traité sur la Tolerance" (1766), vindicated Jean Calas, the victim of Catholic fanaticism, and who, in his "Lettres Chinoises," bitterly attacked religious bigotry, should have fostered anti-Jewish sentiments. His personal experiences with Jews would hardly suffice to explain such inconsistency. He alleges that, while an exile in London (1726), he had a letter of credit drawn on a Jewish banker, whom he refers to once as "Medina" and another time as "Acosta," and through whose bankruptcy he lost the greater part of 20,000 francs. In Potsdam, where he was the guest of Frederick the Great, he had a disagreeable experience with a Jew named Abraham Hirsch. In his treaty of peace with Saxony (1745) Frederick had stipulated that Saxon bonds ("Steuerscheine") held by his subjects should be redeemed at their face value, although they were then listed at 35 per cent below par. At the same time it was ordered that no Prussian subject might purchase any of these bonds after the declaration of peace. Voltaire nevertheless ordered Hirsch to buy such bonds for him, giving him notes for the amount, while Hirsch deposited with Voltaire jewelry as security. Subsequently Veitel-Heine Ephraim offered Voltaire more favorable conditions, and he therefore withdrew his order from Hirsch. The last-named, who had already discounted Voltaire's notes, was arrested; but the enemies of the poet used the whole unsavory transaction as a means of attacking him. The king himself wrote a satire against Voltaire in the form of a drama entitled "Tantale en Procès"; and Hirsch was discharged after having paid a comparatively small fine. 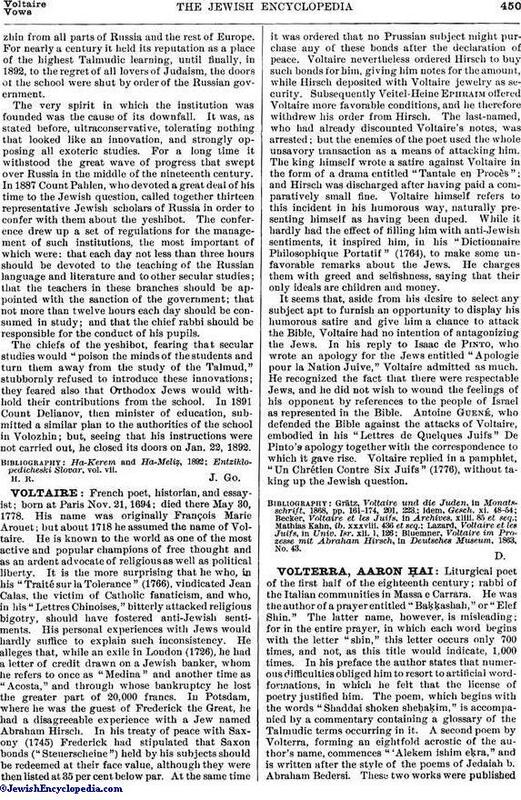 Voltaire himself refers to this incident in his humorous way, naturally presenting himself as having been duped. While it hardly had the effect of filling him with anti-Jewish sentiments, it inspired him, in his "Dictionnaire Philosophique Portatif" (1764), to make some unfavorable remarks about the Jews. He charges them with greed and selfishness, saying that their only ideals are children and money. It seems that, aside from his desire to select any subject apt to furnish an opportunity to display his humorous satire and give him a chance to attack the Bible, Voltaire had no intention of antagonizing the Jews. In his reply to Isaac de Pinto, who wrote an apology for the Jews entitled "Apologie pour la Nation Juive," Voltaire admitted as much. He recognized the fact that there were respectable Jews, and he did not wish to wound the feelings of his opponent by references to the people of Israel as represented in the Bible. Antoine Guené, who defended the Bible against the attacks of Voltaire, embodied in his "Lettres de Quelques Juifs" De Pinto's apology together with the correspondence to which it gave rise. Voltaire replied in a pamphlet, "Un Chrétien Contre Six Juifs" (1776), without taking up the Jewish question. Bluemner, Voltaire im Prozesse mit Abraham Hirsch, in Deutsches Museum, 1863, No. 43.